Bright apartment in a quiet area close to the center of Port Grimaud 1. The "Coches d'Eau" stop is only a few meters far from the building. 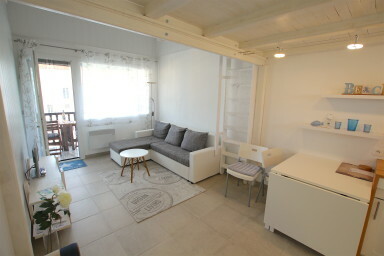 Located on the top floor, it is composed of a living-room with a sofa-bed for a child, an open kitchen, a bedroom with a double bed, a shower-room and separate toilets. On the canal side, a large balcony perfect to have lunch while enjoying the view of the boats in the "Petit Port". A lovely apartment that will charm you!